Tell us about yourselves. Give us a short bio and why you started writing. I began writing as a young girl as a way to make sense of a chaotic childhood. Writing for me has always been both a microscope and an escape, a way to figure things out and then leave them behind or embrace them, whichever made the most sense. I first published in my teenage years, and the satisfaction I got from that stayed with me for a long time. Although I bucked the trend and waited until I was in my 20s to attend college, by that time, I knew I was destined to be a writer, and it’s what I’ve been doing ever since. Even now, the idea of getting paid to write leaves me feeling like I’m getting away with something. Writing, for me, is not a choice. It’s what I do. I’m actually not a writer but an IT Manager who enjoys history and genealogy. When I discovered Perry’s adventures I realized I had a story that needed to be told and having always been fascinated by the writing and publishing process, I decided to proceed with the book. together many facets of Western history. After two days of brainstorming at my kitchen table with Travis and his wife Becky, we had the outline of the book. And I use “outline” loosely, because Travis initially told me he had written about 25 pages himself already and figured he needed another 25 or so. The final book is over 500 pages! I wrote the book and crafted the story, but Travis added passages or sentences here and there, chapter by chapter, things he felt committed to including. Sometimes I had to convince him to include or leave out a piece of information, but in the end, his was the final call. What I appreciated most was the trust he put in me and my experience, how he understood that I had a knowledge of my readership that he probably didn’t have, simply because he had never published a book. Beyond the Land of Gold began as a large research project following the discovery of a collection of rare historical photographs that surfaced within an old family home. 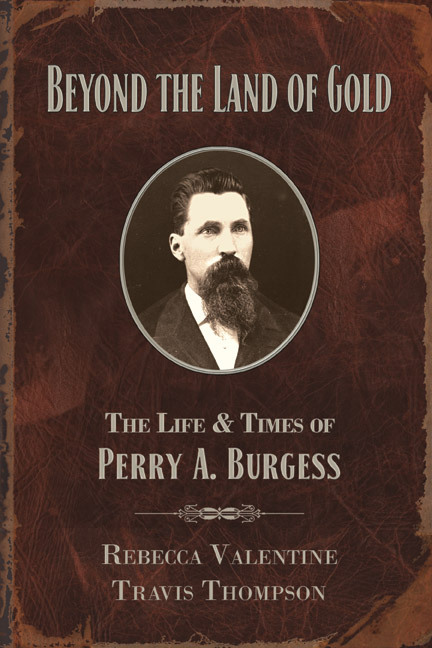 My subject, Perry A. Burgess was a larger than life western adventurer, pioneer writer and connected to my family. As my interest grew, I began to dig further, learning about his family connections to early Steamboat Springs, CO history and the early days of the Steamboat Pilot newspaper. I discovered that Perry wrote a series of pioneer articles detailing his adventures across the west. He submitted these as a ghost writer to the family held newspaper. His life impacted so many areas across Colorado and the west that I realized the book would be well received. Several years of research later, I was ready to compile Perry’s writings, family photos and biography into a single volume for the sake of recording this incredible history. The primary goal was ensuring the work would stand the test of time. We take great pride in knowing Perry’s years of work were properly identified and are now accessible for generations to come. I knew Rebecca Valentine’s background and writing style were perfect for the project. My wife who is also named Rebecca was incredibly helpful in the researching and publishing process.as well. I didn’t approach any traditional publishers with the project, although the Montana Historical Society had previously profiled Perry in their 2 volume set ‘Journeys to the Land of Gold”. Perry Burgess had a following of western writers and historians from Colorado to Montana. The contents of the book were historically significant and much of it previously undiscovered. I independently published primarily because I spent years on researching the book and it had become my “baby”. I therefore preferred to maintain control of the entire project between myself as the researcher, editor and publisher and Rebecca as the author. We have received many marketing ideas and tips. We also enjoyed the awards process and benefits; the staff was incredibly helpful. We enjoyed meeting many of them in March who offered some great advice during the trade show. I have some book signings and events lined up for spring, and I’m hoping we’ll be making some appearances in Montana and Utah. This summer, perhaps? We’ve already held events in Steamboat Springs, Boulder, Craig, and Cheyenne. Travis and I will continue to write features for the book’s companion Web site, and if memory serves me correctly, I will be returning to Steamboat Springs for a book event this summer. The whole experience has been a learning curve for both Travis and me, and for myself, I can say it’s been a lot of fun. I’d travel anywhere with Perry’s story; it’s one of timeless values and hope. Doesn’t get much better than that. Rebecca summarizes the project very well and we are both very proud of the book. Burgess tried so hard to become published from his early home in Steamboat Springs with very limited success. Only after his family’s half interest in the early Steamboat Pilot newspaper did he get published to a city of <300.! With the internet, online publishing and groups like CIPA, the process is far easier today. We will continue to develop the website and companion blog. We also look forward to additional signings, press coverage and feature articles as the book has received multiple awards. Read more about the book in the current issue of Steamboat Magazine. Beyond the Land of Gold is available in Soft & Hard cover, and ebook through Amazon.com and other online retailers. The book can also be purchased in many of your favorite independent bookstores and museums across Colorado. This is such a great interview! It offers first-person insight into a typically atypical indy publishing project process — something of immense value for those just starting out as indy publishers. I think it points up the true value of a group like CIPA to those who’ve chosen to jump into the self-publishing or indy publishing fray, in helping to negotiate a field that — like the subject of this book — is a wild and wooly place to be these days. Reinforces my pride in our “cousin” IBPA affiliate organization — CIPA is a shining example of what we can all aspire to. President, MidAtlantic Book Publishers Assn.